Millennium Recycling Tarps, Tents & Banners (Cloth, Fabric, Vinyl or Plastic) are Not Recyclable. Tarps, Tents & Banners (Cloth, Fabric, Vinyl or Plastic) are Not Recyclable. Banners, Camping Tents and Tarps are NOT recyclable in the single stream… no matter what material they are made of. Vinyl, plastic, cloth or fabric tarps, banners, tents and other types of textiles (clothing, blankets, bed sheets, towels etc.) get caught in the recycling equipment and causes major problems at recycling facilities. If you toss it in, you’re creating more work for the team members who have to physically pull it out. Usually tarps, banners and fabrics are so damaged or contaminated after they arrive that they have to be thrown away after being pulled out of the pile. So please think of the recycling workers and make their jobs easier, keep your tarps, fabric and banners out of the recycling bin. What Can You Do With Tarps, Tents & Banners instead? Instead of tossing them, you could try to upcycle them as totes, bags, wall art, reusable tarps or donate them to others who can re-purpose them. Some online companies like Ecologic Designs and Gorilla Sacks say they’ll take them for upcycling on their websites too so check them out! If you have a tent in good condition, why not offer it to a local community organization or charity? You could also try reselling it on an online marketplace. Thank you for recycling right! There are 0 comment. 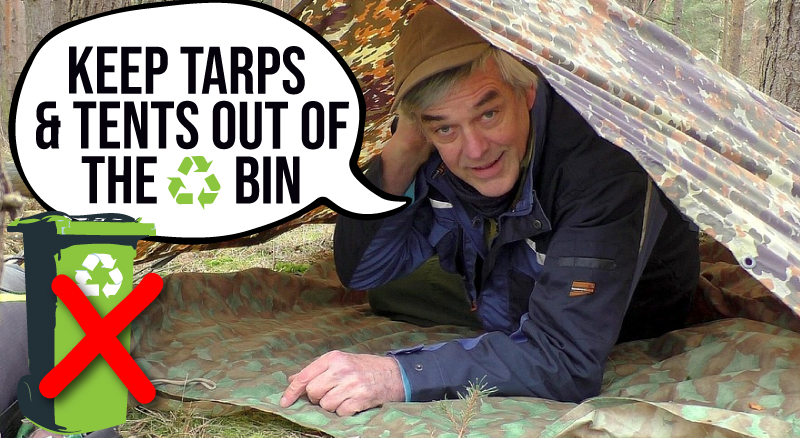 on "Tarps, Tents & Banners (Cloth, Fabric, Vinyl or Plastic) are Not Recyclable."